GMB is now providing drone-assisted inspections and aerial project documentation. 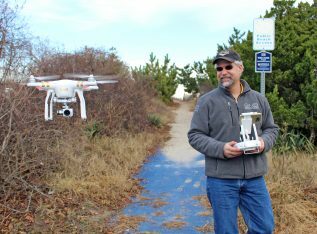 Operated by Matt Dittrich, FAA-Certified sUAS Pilot, our drone can assist with inspections in hard-to-reach places (roofs, chimneys, smokestacks, water towers, etc.) as an alternative to a crane. Birds-eye photos and videos can capture the aerial progression of a project. Here, Matt is taking “before” images of various streets in Lewes, Delaware, prior to their scheduled spring rehabilitation.